There was no Camino “rush hour” today and I kind of missed it! If you have to be in a rush hour, the Camino “rush hour” is a good one to be in. Peregrinos are a happy bunch who almost always wish you a “Buen Camino” when passing and sometimes want to engage in a short conversation, at least to find out where you are from. You see the same faces over and over again, as long as their pace matches yours. The rush hour happens because pilgrims (peregrinos) usually follow the stages of the John Brierley Camino guidebook exactly. 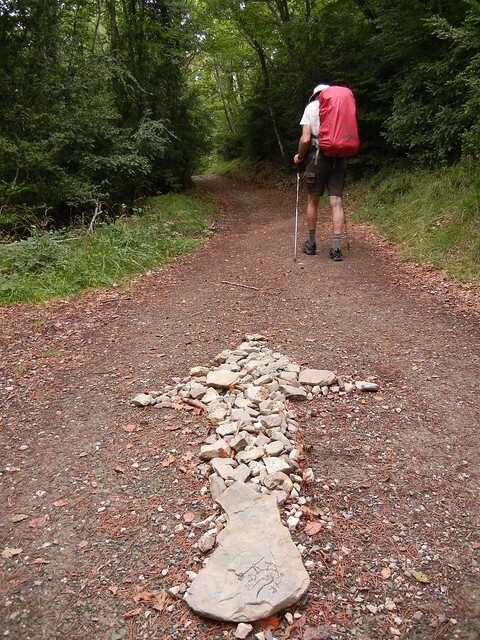 The book has the Camino Frances divided into 33 stages/days. Viskarret, the little town where we spent last night is not at the start or end point of a stage but at mid-point. As a result, we walked alone much of the time with no other peregrinos in sight. Today we took pictures of signs. 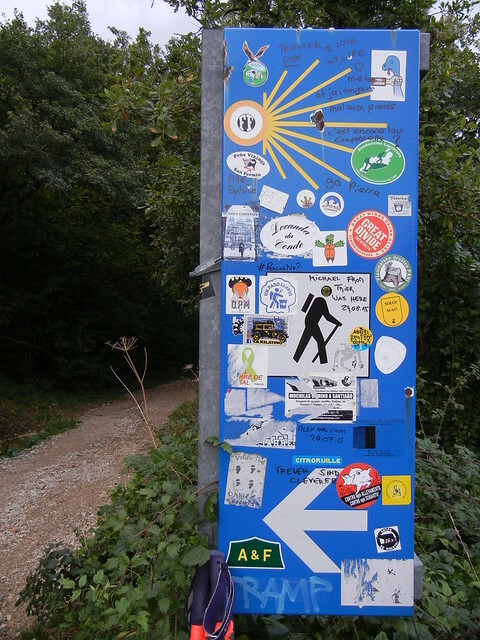 Obviously, it is very hard for a peregrino to get lost. 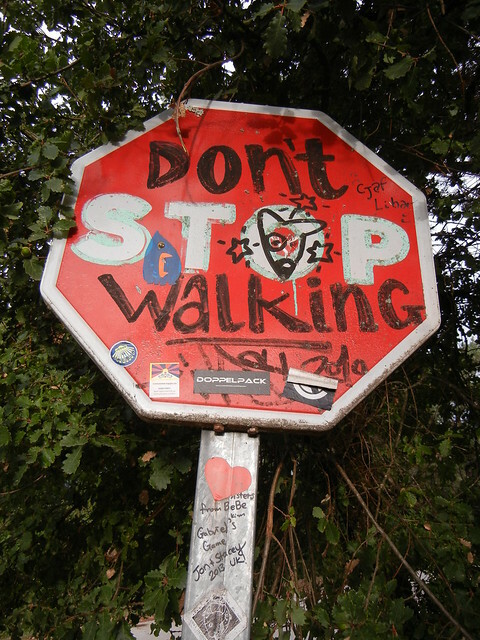 The signs don’t just keep you going in the right direction, but they are a great motivator. The first peregrino we met about thirty minutes after leaving Viscarret was our new friend, Paddy from Ireland, who was heading back to the Corazon Puro in Viskarret where we stayed last night. He forgot his hiking poles so was facing an extra hour of walking today. Walking backward isn’t something peregrinos like to do, to say the least! 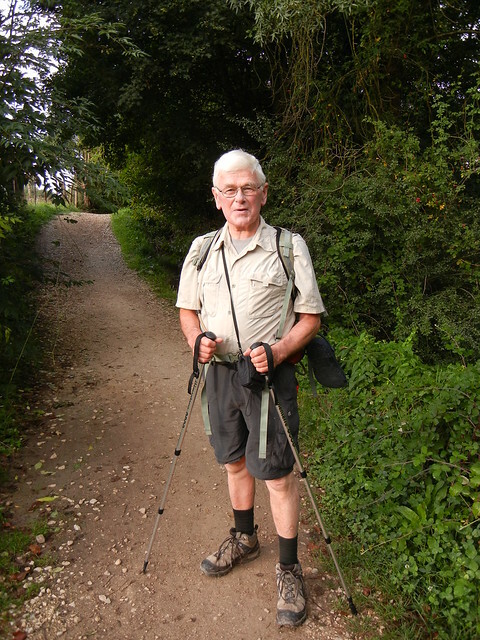 Paddy must not always use his poles, or he wouldn’t have walked so far without missing them. As far as I’m concerned (and I think Dave would concur), walking with poles is like walking with four legs and suddenly having to manage with only two. We’ve become quite dependent on them. En route from Viskarret to our first stop in Zubiri, we met a couple from the Hebredes Islands in Scotland and Leo from Atlanta, Georgia. Later in the day when we settled into our albergue in Larrasoana, we discovered Leo from Atlanta and Paddy from Ireland were staying there too. After climbing the Alto de Erro that forms the ridge separating the Erro River valley from the Arga River valley, there was a steep descent. It was quiet and enjoyable, mostly through beautiful, pine-scented woodlands. The cell phone tower we passed was a good sign that there might be wi-fi (pronounced “wee fee”) available at our destination in Larrasoana and, sure enough, it was. We had written three blog posts but hadn’t, until now, been able to update the blog. So we are not only dependent on our poles, but on wi-fi too! Down in the valley we first came to the busy, industrial town of Zubiri and treated ourselves to ice cream bars and some relaxation time. I enjoyed a foot massage (for me, by me) while Dave went shopping for a new rain poncho. He got it just in time before a brief shower came along and he could put the rain poncho to the test. Obviously his old one went straight into the garbage can. When it was time to move on from Zubiri, we almost headed toward the highway instead of the trail. A helpful man who was sweeping the sidewalk (yes, sweeping the sidewalk!) spoke to us in Spanish and, with the bit of Spanish I learned and some sign language thrown in, we understood that we were going toward the busy road instead of the trail. He pointed us towards the “sueno” trail. Ah yes! “Sueno” means “sleepy.” We definitely wanted to take the sleepy route! 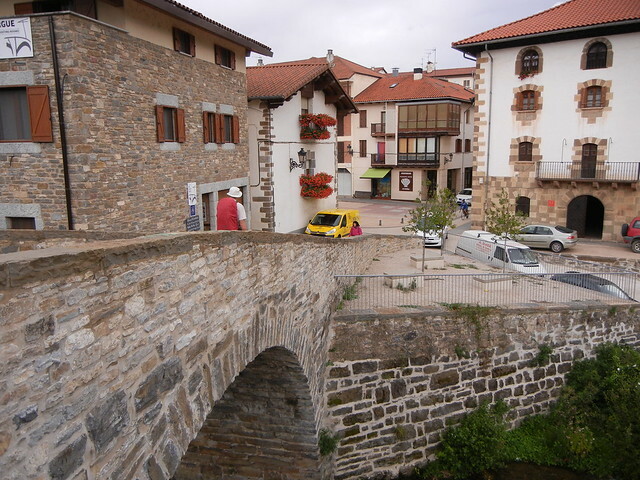 Larrasoana, our destination for the day, is a smaller and quieter town than Zubiri, and worth going the extra distance. We tried unsuccessfully to get a private room for two in a pension. Sharing a dormitory with others isn’t a problem for me, but Dave has a better sleep if we are in a room for two. We ended up at “San Nicholas Albergue” which was highly recommended. It is spotlessly clean and has only four people per room. I am still trying to figure out what lesson the Camino had for me today. The verbal sparring over the subjects of religion and politics that went on during dinner made me glad when dinner was finished and we could leave. On the other hand, Dave found it interesting and went back downstairs for more. It seemed to me that the heated conversation wasn’t in keeping with the positive, loving spirit of the Camino. 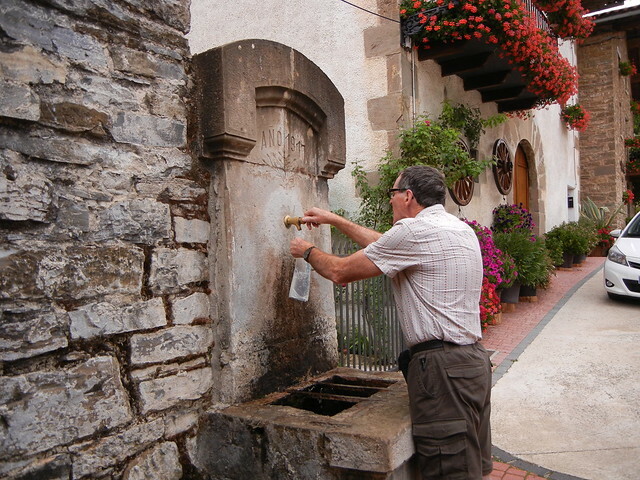 Maybe I had a “Camino moment” and there is a lesson to be learned …Or maybe not! I am enjoying the photos and your adventure. The horse photo in the mist was stunning!! You are so committed! Your writing is very entertaining, yet informative, and as others have commented, the pictures are stunning. I love the one of the beautiful village from the bridge! Keep it up. I feel like I’m enjoying the experience vicariously right along with you! Dave’s poncho reminded me of Ken’s experience several years ago in Scotland … those cheap ponchos are really cheap!!! I wonder if Dave’s soaps will be threaded entertainingly throughout your various stopping points?